Sutton’s rich tapestry of living brings back a traveller to stay. Like so many monster homes, the de rigueur grand entrance and cathedral ceiling is meant to impress. Town of Blue Mountains’ new town hall’s lofty entrance to its 26,000 square foot building is meant to do the same: lots of glass and echo while the Town wastes all that heat so it can look important to the ski and golf crowd. By wasting public money on frills that will stay around and by not creating a sustainable action plan for future generations, the town ‘leaders’ expose themselves even through the smoke and mirrors. The town’s very expensive “Sustainability Path” 107 page ‘plan’ leaves youth in a vulnerable position by not taking the actions needed to protect their future, just as the UN celebrates on August 12 the start of International Year of Youth: Our Year, Our Voice. “Dialogue and Understanding” is the theme for the world-wide celebration of youth, but the Town of Blue Mountains’ inability to hear youth’s voice is astonishing. It is impossible to reconcile nor justify the huge Terrasan project and have a ‘plan’ for the future. As of June 29, with only one more day to sign on, only one third (31) of the organizations who initially supported the Integrated Community Sustainability Plan.decided to pledge support in seeing through with its implementation. Reading through the ‘plan’ gives a person the impression that the authors have no stake in its implementation either. 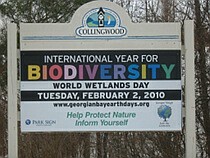 Actions and goals regarding biodiversity and habitat quickly get washed away when ‘Village’ developments and the extension of highways 410 and 427 or regional airports are to be considered in getting tourists here. Forget about the idea of peak oil and that we probably will have to do with far less. Meanwhile the words ’science’ or ‘Earth’ never get mentioned in the Environmental Stewardship and Natural Heritage, Conserver Society or greenhouse emission reduction schemes laid out in the ‘plan’. Out of 11 or 12 people on the plan’s steering committee, no more than two were youth at any given time and only 2 women were part of that committee. At the same time, the Town tells us that 25% of the population is under thirty years of age. Furthermore only elite groups were brought into the process spanning more than a year. The 2.5 hour meeting with community should have been the start of democratically initiated consultations but that was all the time community got from the town. At the same time the Town tells us that they have a dream being put forward in the plan. “We are committed to ensuring that our every action finds a sustainable balance.” The Town can’t even get their greenhouse reduction numbers right: on the website, www.thebluemountains.ca/community-emissions-invent.cfm the greenhouse gas base line used is 1994 but in the ‘plan’ it’s 2005. Tragically 2005 appears to the base year that emissions will be reduced from. There is an election coming. For a town that can’t even get an anti-idling bylaw in place but spends millions of dollars on its palace and its 2050 pie-in-the–sky ‘plan’ destined for the shelf, many new caring faces brought to local government might bring the critically needed change youth need and deserve if they are to survive 2050. Ontario Trillium Foundation was pleased to announce this week a $150,000 grant over two years to two charitable groups in our area that focus their attention on the well being of Nature and humanity’s harmonious place in it. Elephant Thoughts Global Development Initiatives is a vibrant and successful organization that has brought its educational initiatives to many parts of the world. Jeremy Rhodes, C.E.O of Elephant Thoughts, and his staff have done some incredible educational work up north and across Canada with many First Nation groups. In many instances, Jeremy’s inspired work means the difference between a student graduating from high school or not. Elephant Thoughts teamed up with Georgian Triangle Earth Day Celebrations to put together the Eco Action Centre. GTEDC has an action oriented approach to mitigating biodiversity and climate destabilization problems, and Trillium appreciated the educational/action commitment of the founders of the Eco Action Centre. The Centre is based at both the offices of Elephant Thoughts in Nottawa and deep in the woods in Kolapore Wilderness at an off-grid location. At the wilderness location, paid Eco Action youth will try to work on problems that their parents have not been able to solve or commit to putting into action. Biodiversity loss and climate destabilization will certainly have a huge impact on their generation and these youth know that.. Eco Action Centre youth are leaders and wish to be ambassadors for Nature in their schools and community. It does help that esteemed professor and author, Thomas Homer-Dixon, and EcoJustice action lawyer, Albert Koehl, will be sharing their knowledge of the issues with Eco interns while sitting under a tree deep in the woods. Aide Fernandez, fourth year university biodiversity student, and Fred Dobbs of Nottawasaga Valley Conservation Authority will be there too on occasions, knee deep in cold trout streams uncovering mysteries with our team. Besides putting up clotheslines (write for yours now), biodiversity hands-on skills with honey bees, working on the new community garden to foster localization of food and agrobiodiversity, cruising down rivers with Free Spirit Tours and helping them to create biodiversity tours, and working on an organic farm to feel hands-deep the soil and sustainable farm practices, the Eco Action group will be lowering their carbon footprint by cycling as often as they can and doing fifteen hours of research and reading a week to become the true mentors for a biocentric society. 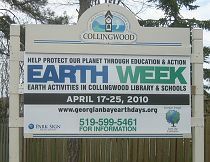 Eco Action Centre youth have been invited to research and write an article in the Collingwood Connection. During the school year a new co-op program brings students to organic farms to help set up biodiversity plots near schools for younger students. This is what Lisa Farano, dedicated and hard-working president of Elephant Thoughts had to say about their Eco Action initiatives made possible by our Trillium grant: “Zoo Guts is an environmental education program focusing on habitat conservation, species at risk and recovery programs and the topics of environmental science, anatomy and biology.. This one of a kind installation will surround five giant inflatable animals which kids will crawl into and literally replace the working guts. Students will be required to identify both healthy and ‘sick’ guts further enhancing their knowledge of species at risk and their affiliated recovery programs. Most teachers will agree that there is nothing more empowering for a person when trying to fully understand a topic than learning it and teaching it to others. Elephant Thoughts runs some of the best science day camps for elementary students in the Georgian Triangle area. We will incorporate these sought after camps into our Eco Action Center by allowing our interns to help create the camp by creating programming that they in turn will teach to elementary students. In addition to the research needed to create their own activities, interns will learn alongside certified teachers to teach engaging curriculum and activities in the field of environmental science. This program will teach our interns solid fundamental environmental science, leadership skills, confidence, and a passion to pass on their knowledge. The camps will be held in rural communities in the Simcoe area. The interns will participate in two weeks of camp training, will have research and activity development assignments, and will teach in up to 10 weeks per year of camp programs. Be the Change Documentary + Discussion Film Series will be a key component in the Eco Action Center. The medium of film has always been an excellent form of communicating important messages to both youth and adults. This discussion series has already begun and will continue to persuade residents of Simcoe County into action where it relates to social justice and the environment. We believe that one of the greatest strengths of empowered youth is their ability to influence adults, especially their own parents. Our hope is that by uniting this series with the Eco Action co-op students we will be able to influence those into action who need it the most. Copyright © 2009 Georgian Triangle Earth Days Celebrations. All Rights Reserved.